When an artist creates his own unique visual world, an architect designs of his environment, a playwright plunges us into the world of his characters, a composer sets a certain rhythm, then a theater artist has the global task to unite the creative vision of all participants of spectacle, while staying true to itself and its representation of the product. The audience forgets where is it in present moment, immersed completely in the world of heroes. The artist decides what set design should be on the stage, luxurious or minimalistic. He knows exactly how to create the illusion of an imaginary world, he feels playwriting, defines the means of expression that accurately meet the performance. Finally, he decides to technical issues; if imperfect construction of the theater, he know how to fix the angle of the plane to the plane of the stage, for the actors do not «sit» «on the nose»of viewers; add depth to the scene, to consider all viewpoints, lighting, costumes, the positions of actors at some point. If you could imagine the size of a stage, it is a huge area at least twice as much as what we see in the portal from the auditorium. Then a theater artist is even a monumentalist. Truly, this artist is a creative titanium. Magnificent theater artists were a lot in all time, may be they weren’t known widely the history as painters, sculptors and architects. But their contemporaries appreciated them. Have you ever seen that the audience would be applauded standing? Their work often produces a such effect. The specificity of a theatrical painter is that the scenery hasn’t a long life, it is designed for large spaces. Usually stage set has collapsible structures are stored in warehouses, where perish from abrading by frequent mounting and dismounting. Of course, there are sketches, layouts and costumes that museums and private collections stored and displayed them. Watching a part of this theatre props we try to imagine the scale of their creations. And how they could to impress. 1. The stage mechanism for the image on the pitching ship. 2. The presentation of Oprah in Turin, 1740. The painting by Olivero. The artists create a magical scene and the virtual world without any three-dimensional programs since the emergence of theater in ancient Greece. 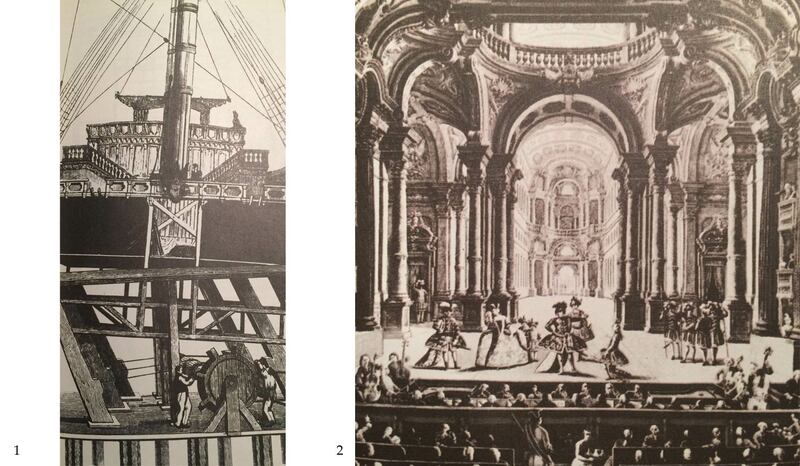 In the Renaissance, when perspective reigned in art, theatrical backdrops had illusory depths of entire streets. 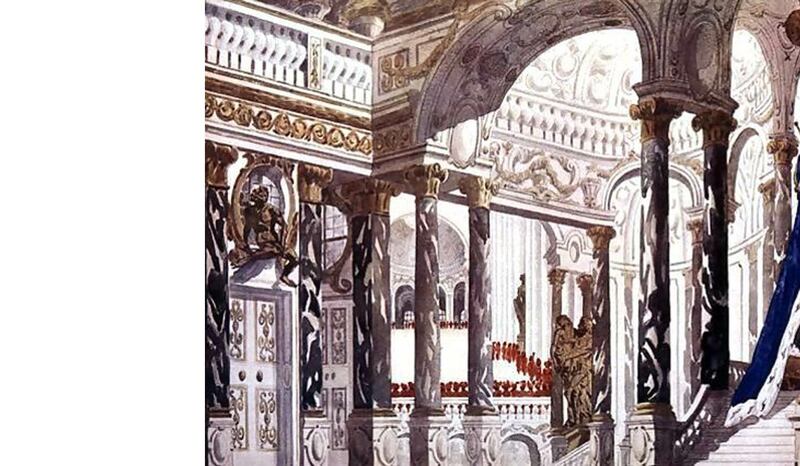 Baroque popularized moveable decor sets, It became more exciting for audience. Simple techniques recreated sea storm or flyings of angels above the stage. Today work of theatrical artist is still a titanic labour, requiring big imagination and inspiration. And spectators applaud the scenery in same way. 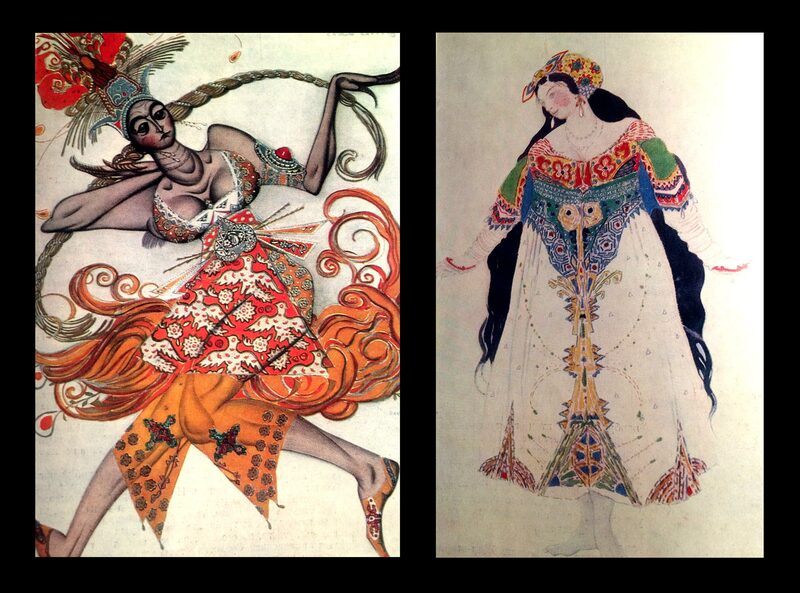 The sketches of costumes of Bakst for Diaghilev’s «Ballet russe» in Paris fascinate their energy, passion riot of colors. These lines are impulsive, They run for the dancer and repeated his movements. The fabrics of costumes, light or heavy, plain or ornamental, always added features to the nature of the characters. Leon Bakst studied at the St. Petersburg Academy of Arts, joined the association «World of Art» (Mir Iskusstva), which at one time gathered together the people with same passion for art and aesthetics. And though completely different, they completed each other and gave impetus for further work. There was the uniqueness of this phenomenon. The creativity of Bakst opened Russian art and culture in Europe and America, along with Dyagilev and those talented people, he gathered around him. Their works revived interest in Russian culture and even introduced the fashion for everything of russian. Being quite successful portrait painter, and that considered himself as only painter and graphic artist, he reached the highest peak of its creativity, namely in set design and costume. It happened, as it always happens, by chance. He was asked by the imperial court to createthe scenery for the performance «The Fairy Doll». It was supposed to present at the Hermitage Theatre only one time as a light entertainment for the emperor after supper. But the spectacle had a such success that it entered the repertoire of the Mariinsky Theatre for another 20 years. She was presented even after the revolution. 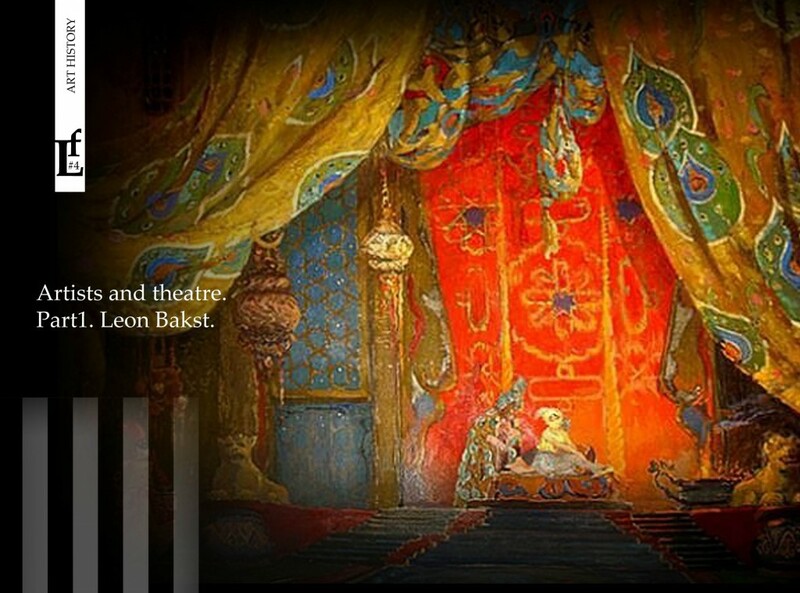 The artistic life of Leon Bakst as a theater artist began from this performance, that brought him the worldwide fame in future. Alexandre Benois wrote: «In this field Bakst from the first steps took downright dominant position and since then has remained unique and unsurpassed». 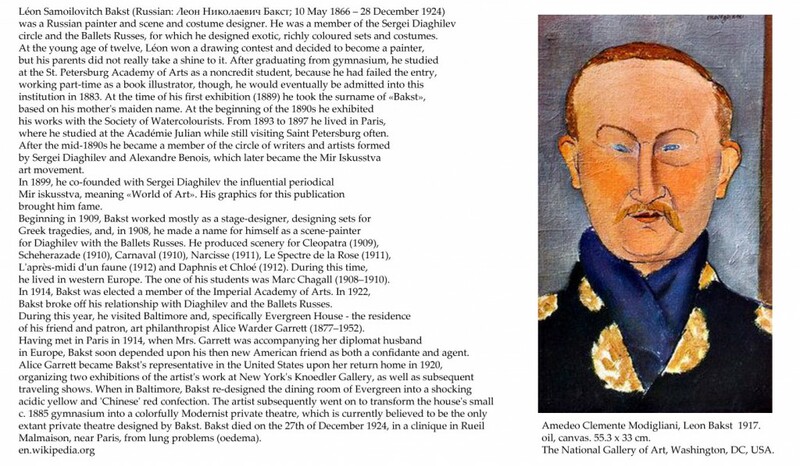 Mstislav Dobuzhinsky wrote about this period: «The penetration of art into life over the ramp, the reflection of the theater of everyday life, its influence on the fashion were that deep impression which accompanied the great triumphs of «Russian Seasons «Diaghilev in Paris. 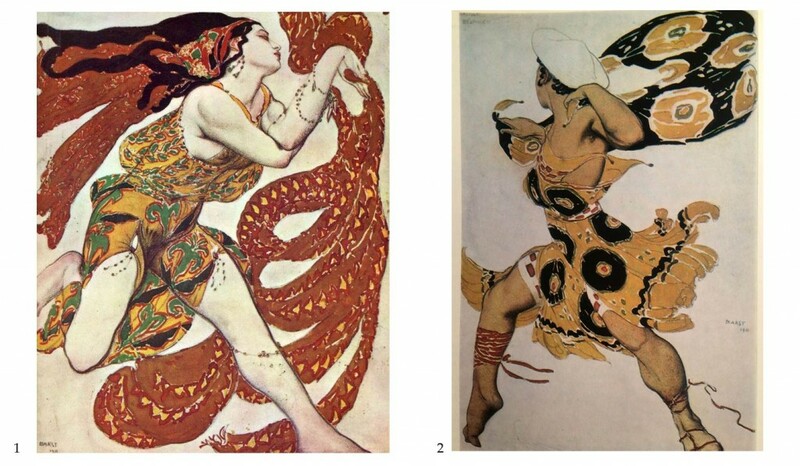 The public taste followed for those triumphs, in the greatest degree for Bakst and for the new revelation that he gave to their exceptional beauty and charm of the performances that hit not only Paris, but also the whole cultural world of the West». 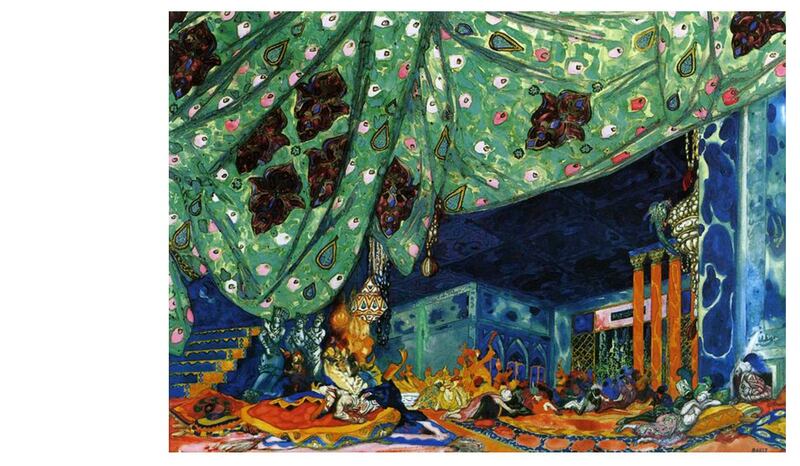 The set design for the ballet «Scheherazade». «I’m looking for the nuances of the rich, gorgeous, dazzling» – said Bakst. And he reflected fully it in the decorations of the ballet «Scheherazade». The color played a major role in the design of the play. Bright red, blue, green, pink tone gave the impression of wealth and luxury of the East. The costumes harmonised with decorations. Bakst wrote about them. «The fallacy to think, ‘said the artist, suits win on a neutral background. They (costumes) get a hundred times more force against a bright background. It is only important to reconcile the suits to the background». L. Bakst. 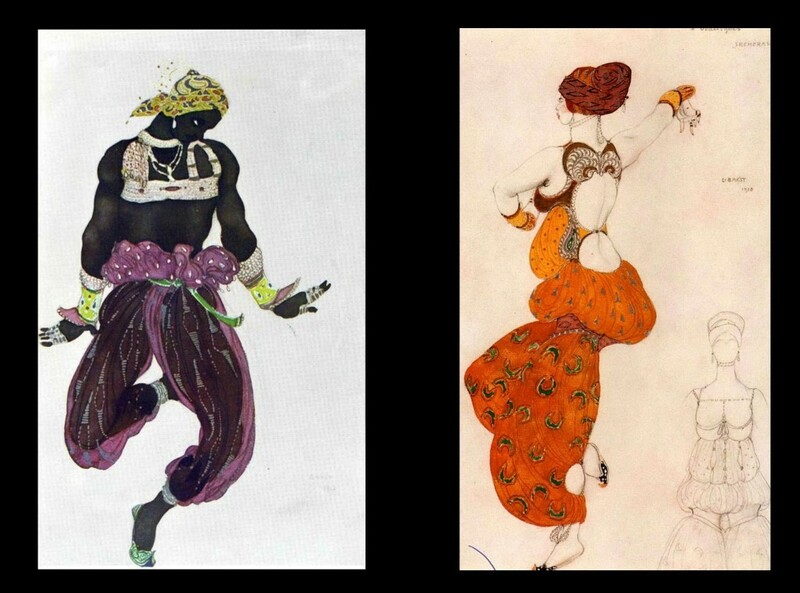 The costume designs for the ballet «Scheherazade». 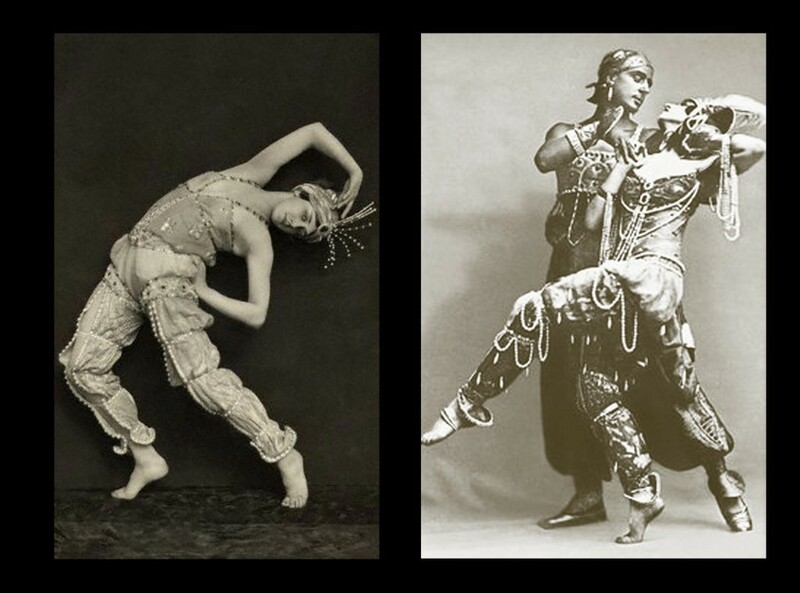 The photos of T. Karsavina ,M. Fokin and V.Fokina in the ballet «Scheherazade». Except the ballet «Scheherazade» in«Russian Seasons» 1909-10’s, Bakst participated in the production of the ballet “The Firebird” by music of the budding composer, an apprentice of Rimsky-Korsakov, Igor Stravinsky. 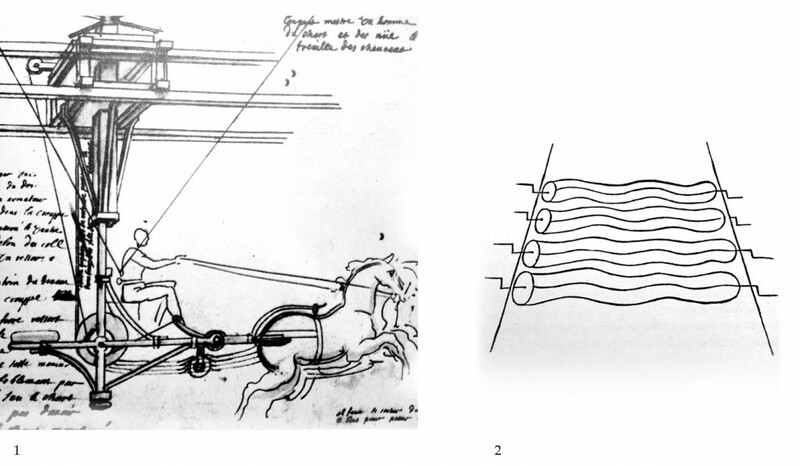 Diaghilev could discover talents. Initially, the music had to write Liadov, but struck up a job and the creating of scores gave little-known at the time Stravinsky, who implemented brilliantly. Fokin worked on the choreography, Golovin made the scenery. His sketches have been taken, but the two suits did not like There were Firebird and Beloved Princess. This work was entrusted to Bakst. L. Bakst. 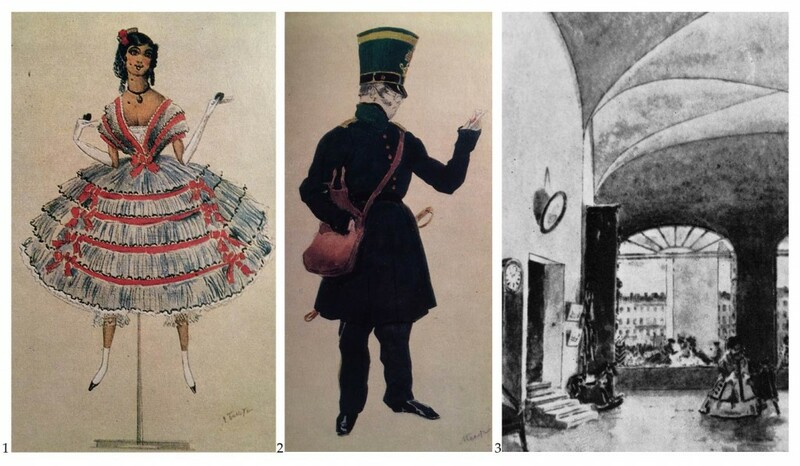 Costume designs for the ballet «The Firebird». The attire of Firebird should to create the impression of glowing feathers, which would highlight on the background of the garden, that Golovin painted in dark blue tones. Usually, dancers depicting birds danced in short skirts. The Firebird of Bakst was different. The orient trousers, the top transparent skirt, with a decor of peacock feathers, a tall hat, richly ornamented were gathered in this costume. The strings of pearls and gold bracelets complemented the sparkling image of this magic creature. In addition to its already fiery yellow and orange range of colors it gave the fantastic effect. 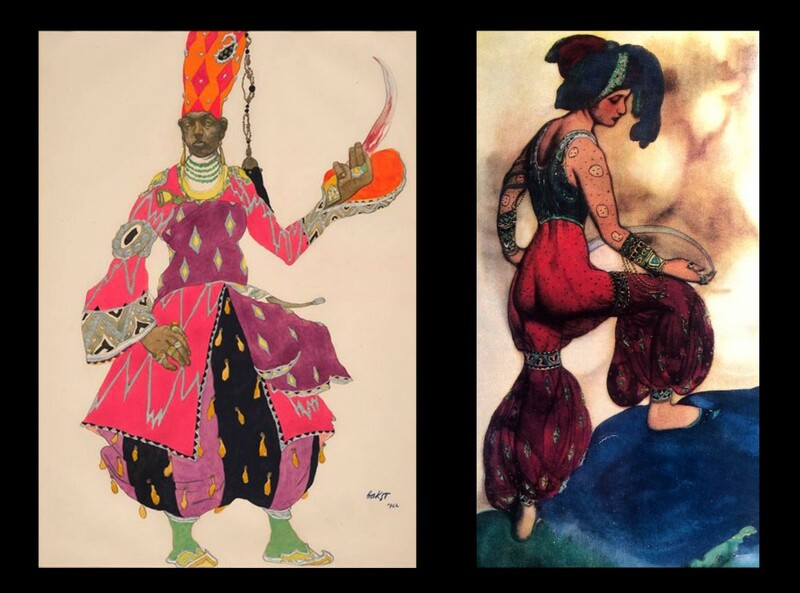 Bakst had an impact not only on theater artists for many years, but to this day fashion designers are inspired by his work and create a fashion collections. The then king of fashion of Paris Paul Poiret bought some sketches of the master. In the shops there were outfits a la Bakst. Erte (artist of Russian origin, who lived in Paris, when Bakst worked) admitted that he fell under his influence, and later, Yves Saint Laurent, the great fashion designer, also devoted a lot of work for the theater and cinema expressed his admiration for the work of Leon Bakst. Generally, theater artists seem a bit as magical persons. They visualize the fantastic world of a creator through their own vision. They make the atmosphere around us led to believe that the dramatic work comes alive and is coming from the stage in real life. And it is fascinating mystery. Bakst was the artist with such a force. * Interview in «The New York Times Tribune», September 5, 1915.